Educational Qualification: (BE/B.Tech./B.Sc. Engineering) in respective branch of engineering. Age: 28 years for UR category. For other, pl refer advertisement details. Selection by GATE 2017: Candidate shall possess valid GATE-2017 score in the corresponding GATE-2017 papers mentioned above. For the above posts the selection methodology will comprise three stage selection process i.e. – Merit as per GATE 2017 Score, Group Discussion/Group Task and Personal Interview. 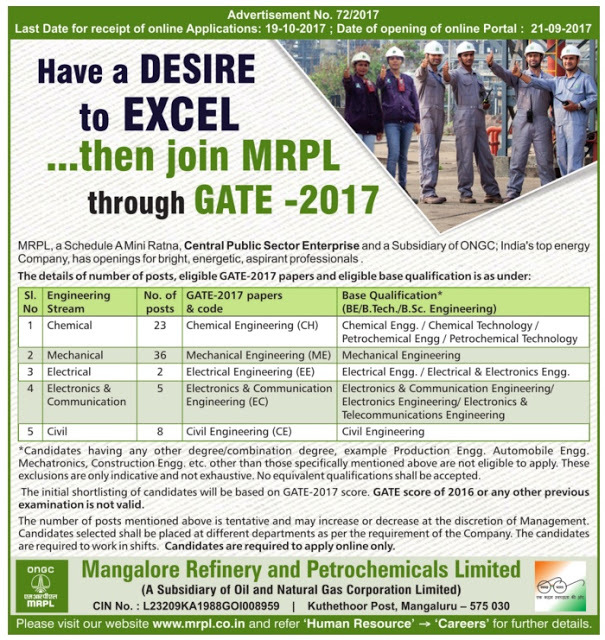 How to Apply: Apply Online at MRPL website from 21/09/2017 to 19/10/2017 only.